Augustus Boggs, or Gus as he preferred to be called, was considered Riverside’s first architect, arriving in 1880. He left Nashville where he was educated in architecture, and worked in Los Angeles with his partner Mr. Ripley. Boggs started out his career in Riverside by designing, with Ripley, a number of homes in 1880. After moving to Riverside in 1881, he consolidated his reputation by designing and building the mansard-style home for wealthy horticulturalist, A.P. Johnson and another home for his brother, O.T. Johnson, in 1881. Noted for his honesty and hard work, Boggs operated both as an architect and a contractor. He built public buildings including the Riverside Banking Company Block for O.T. Dyer. Other early buildings in Riverside were the Dyer Brothers Bank (1880) on the northwest corner of Main and 9th streets, the Baptist Church (1881), the Citrus Pavilion (1882), the Methodist and Arlington Presbyterian churches (1886), the Henry Jarecki house (1886) at Brockton and Beechwood, a major addition to the Lyman C. Waite home (1890), and the construction of the Universalist Church. Boggs also worked for architect and engineer George Chaffey in Ontario. He built a home for Chaffey, an electric light tower, and the Ontario depot and hotel. In 1882, Boggs became a part of the saga of the failed dreams of Emil Rosenthal for Mount Rubidoux. Emil Rosenthal bought 10 acres of land at the foot of Mount Rubidoux at the height of the 1884-1887 boom years. He and his partner, John T. Jarvis, a real estate businessman, subdivided the property and Rosenthal commissioned Boggs to build a house on a portion. The balance of the property was to be a 240-room grand hotel, called The Rubidoux, overlooking the balance of the subdivision. When the economy crashed, Rosenthal sold his house plans and seven lots to Jarvis and left Riverside. Jarvis completed the house today it can be seen near Evergreen at 4492 12th Street. In 1887, the land boom had given rise to a spate of elaborate Southern California hotels. Boggs was also involved in The Lordsburg, a 150-room hotel. The $10,000 hotel was underway when a severe wind struck in 1887 and damaged the partially-completed hotel. Boggs had been paid only $3,903 for his original work and was never paid anything for the lost construction work. In 1900, Boggs designed the Riverside County Hospital, built to replace an earthquake damaged earlier hospital in San Jacinto. Located on a 70-acre site at Magnolia and Harrison, the building may have been the first to use the new Mission Revival Style as a design, although First Church of Christ Scientist at Lemon and 6th Street was also underway. In 1901, Boggs designed the Cornelius Rumsey house on Hawarden Drive. This 11-room Victorian style house is still owned and occupied by family members. The firm of Boggs, Wilcox and Rose was housed at the Glenwood Inn. Frank Miller hired the firm to construct Sherman Institute at Magnolia and Jackson Avenues. Finished in 1902, it housed students transferred from the old Perris Indian School near Val Verde. Miller also hired Boggs’ firm as contractors when he decided to move the older portion of the hotel to face 6th Street when he expanded the Glenwood Hotel so that the main building of the soon-to-be called Mission Inn could face what is now Mission Inn Avenue. Three other note-worthy homes that Boggs built that are still standing are the home 4587 Mulberry for furniture store owner William Sweatt, a director of Orange Grower’s Bank, the John J. Hewitt house on Orange Street, and the Hays-Pattee house. This house, built for man-about-town Tom Hays, Cashier of the Orange Growers Bank, was constructed on blue granite native stone. Hays, however, never occupied the house. The same month it was completed, November 1903, Hays was caught for embezzling $95,000 from the bank causing it to fail and Hay was jailed. Although Hays lost all his Riverside property, he was not convicted but died in 1907 in Ocean Park. Although Boggs was prolific and successful in his career, he suffered personal loss within his family. His first wife Anna Willingham died in Tennessee. Two of his sons, Charles, a twelve year old from his first marriage and Augustus Jr., a toddler, died in 1886 in Riverside within days of each other. Boggs second wife, Mary “Mollie,” one of the 16 founding members of the Riverside Woman’s Club with Dr. Sarah Maloy and Alice Holmes, wife of Elmer Holmes, died in 1906. 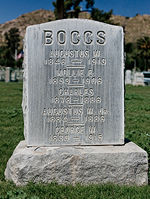 After his wife’s death, Boggs moved to Los Angeles where he died in 1913.